Culture Clash clubnight returns to test out the famous Band on the Wall rig! 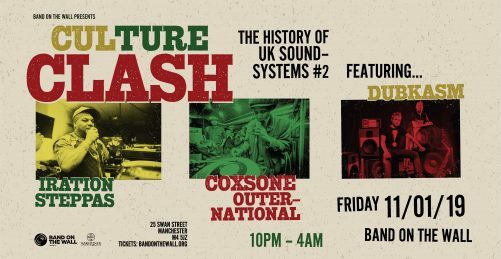 Join us for a celebration of sound system culture with a massive lineup featuring Sir Coxsone’s iconic Outernational soundsystem, the big sound of the Iration Steppas and Dubkasm. This unmissable reggae party takes you through the incredible history of UK Sound Systems! Interest in reggae sound systems is currently at an all-time high, and there’s a younger generation of reggae lovers from across the world building their own amps and speakers, cutting dub plates and starting record labels in greater numbers than ever before. The MCs and “live” mixes that were synonymous with reggae sound systems of the past have returned, and there’s now a wealth of festivals, films, exhibitions, books, online communities and academic studies representing all aspects of sound system culture. It’s had a massive influence on genres such as hip-hop, drum & bass, UK dub and grime, and also left an indelible stamp on fashion, language and a range of other lifestyle choices. “I don’t think you can have a conversation about sound-systems in the UK without mentioning us,” says Lloyd Coxsone. “We’ve been there and done it, and we’ve inspired a generation of sound-systems worldwide.” The veteran soundman has won every accolade the reggae world can offer, and no other sound-system in England can claim such mythical status. Iration Steppas was originally set up by Mark Iration as a sound system in Leeds, where he played the latest sounds at blues dances, clubs and parties. With a posse of like-minded individuals Iration toured the country absorbing various sounds and have been shaking the floors of reggae venues, parties and festivals ever since. Dubkasm are comprised of childhood friends Digistep and DJ Stryda, who kicked off their dub project in the mid-’90s before going on to launch their Sufferah’s Choice label in 2003 in order to showcase their studio productions. Their 2009 debut album ‘Transform I’ was a culmination of their work so far, collecting tracks from their previous 12-inches and including vocal turns from Dub Judah, Levi Roots and Afrikan Simba. A dub version of the entire record along with a remix CD completed the Transform I Trilogy in 2010. Dubkasm continue to push out a positive message through quality roots and dub reggae productions and regular live shows across the globe.